General purpose soft foam ear plugs for all noise reduction and hearing protection needs. Small size also good for protecting ears and those with smaller ear canals. ► Ear plugs must be inserted properly for optimum performance. 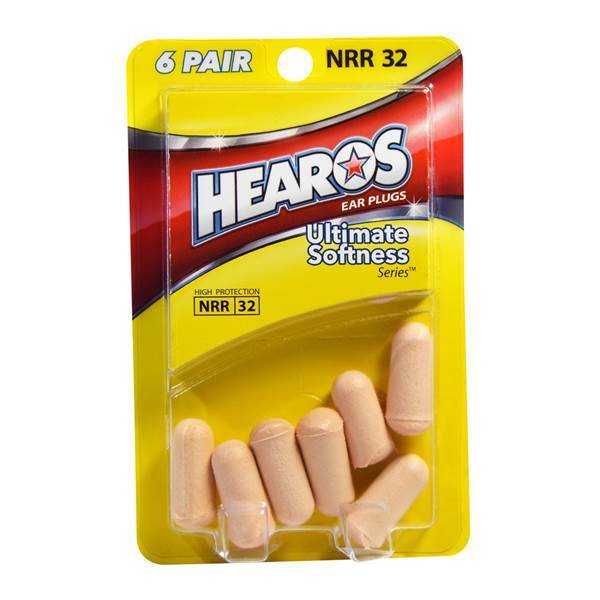 ► With clean hands, firmly roll entire ear plug between thumb and fingers to form a thin tight cylinder. 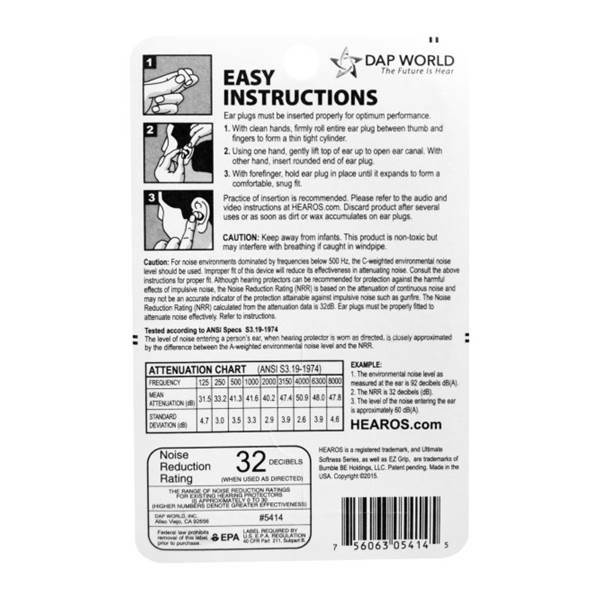 ► Using one hand, gently lift top of ear up to open ear canal. 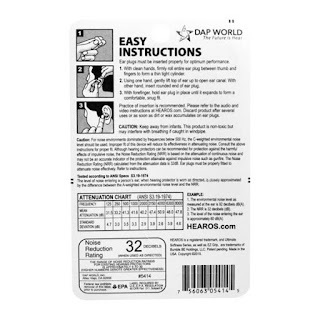 ► With other hand, insert rounded end of ear plug. ► With forefinger, hold ear plug in place until it expands to form a comfortable, snug fit. ► Practice of insertion is recommended. ► Discard product after several uses or as soon as dirt or wax accumulates on ear plugs. ► Latex free. HEAROS proprietary PolyUrethane (PU) foam formulation. Caution: Keep away from infants. This product is non-toxic but may interfere with breathing if caught in windpipe. For noise environments dominated by frequencies below 500 Hz, the C-weighted environmental noise level should be used. Improper fit of this device will reduce its effectiveness in attenuating noise. Consult the above instructions for proper fit. Although hearing protectors can be recommended for protection against the harmful effects of impulsive noise, the Noise Reduction Rating (NRR) is based on the attenuation of continuous noise and may not be an accurate indicator of the protection attainable against impulsive noise such as gunfire. The Noise Reduction (NRR) calculated from the attenuation data is 32dB. Ear plugs must be properly fitted to attenuate noise effectively. Refer to instructions.